M-Audio's new wireless controller keyboard aims to free you from the restraints of MIDI cables. I have to admit that when I was first asked to review M-Audio's latest keyboard controller, my reaction was perhaps slightly less enthusiastic than it could have been: something along the lines of 'oh, cool, a wireless controller keyboard'. However, when I got my hands on it, I began to realise just how useful the absence of wires actually is. And surely it's far better to write music on your sofa than while sitting at a desk with a computer? It gets better too; not only is the Mid Air 25 completely free of cables, it's also lightweight, compact and (those magic words) class-compliant — meaning that it doesn't require drivers. All of this makes using the Mid Air 25 a breeze. I'd even go so far as to say it was great fun! I took it to the Edinburgh Fringe Festival, where I was staying with members of a theatre company with whom I'd been recording a charity CD. Before realising the true implications of having a wireless keyboard, I thought the period away would be down-time from mixing their project, but it was soon apparent that having the Mid Air in my bag and the group's pianist in the next room was an opportunity not to be missed. In the box alongside the keyboard is the wireless receiver, a small box with a USB connection that uses technology provided by the Frontier Design Group (creators of the Tranzport wireless transport controller, which found a fan in Paul White in the July 2005 edition of SOS). The receiver also accommodates a one-In, one-Out MIDI interface for use with any wired MIDI equipment. M-Audio provide a USB cable for the Mid Air 25 receiver and also include a DC power supply and a set of six AA batteries — which is generous, as they're under no obligation to supply either of the latter two. 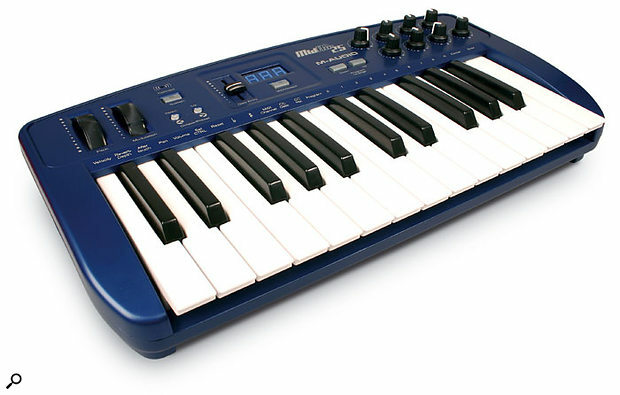 The Mid Air 25 receiver.Connection is easy — plug the Mid Air's receiver into a spare USB port on your computer, switch the keyboard on (which illuminates an almost blinding three-digit blue LCD) and hit a few keys, which should cause an LED on the receiver to light up, confirming that MIDI data is being received. Adjust the appropriate MIDI input settings on your sequencer or software instrument, and hey presto, you're up and running. As the system uses the ISM radio frequency band, which serves technologies such as Bluetooth, WiFi, and RFID, I was expecting some kind of 'pairing' procedure, but the user manual says this is not necessary in most cases. However, there are guidelines for pairing, if a problem occurs: simply press the Wireless Connect button on the receiver and keyboard simultaneously. To avoid interference on the ISM band, it's advised that you don't use your Mid Air system near a microwave oven or cordless phone, as they can interfere with the transmission! Despite being class-compliant, the Mid Air package incudes driver discs for using the hardware with any computer that takes a dislike to the system. The manual also says that if you intend to use the keyboard with multiple software applications simultaneously, utilise long SysEx commands, or use other class-compliant USB audio devices simultaneously, the drivers are recommended. Battery life is impressive — the Mid Air is supposed to last for 20 hours on one set of AAs. I've been using it for a month, on and off, and the batteries still seem to be going strong. Reassuringly, in the event of the batteries running out or the system experiencing extreme interference mid-gig, the keyboard sends out a mayday signal in the form of 'MIDI reset: all notes off', ensuring that there are no stuck notes. The products in the Mid Air range aren't miracles in themselves. Aesthetically, the Mid Air 25 is the same as the Oxygen 8 — a regular two-octave USB/MIDI controller with eight knobs, a fader and a couple of benders. It even has the same MIDI output, for wired operation, and sustain pedal input. The great thing about them is the concept: wire-free operation and class-compliance means you can literally turn on and play, forgetting all those 'have you got a spare USB cable 'cause mine's not long enough' and 'did you bring the driver disks?' quandaries. More please! The keyboard is lightweight and portable. Good range of hardware control options in a small space. The knobs are packed rather tightly, making it tricky to get your hands round them. It's quite difficult to set small incremental changes with the fader. A great little keyboard for recording ideas on the go. As with all two-octave keyboards, you can't 'spread out' while playing, but its portability and convenience outweigh this issue.